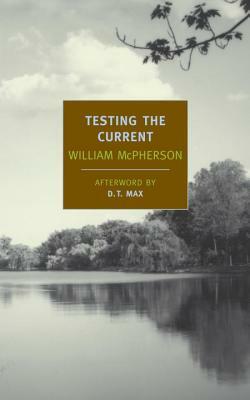 Written almost thirty years ago by Pulitzer Prize-winning book critic William McPherson, Testing the Current is a gem of a book that has been out of print for twenty-five years. Now reissued by New York Review Book, it is well worth savoring slowly and carefully. The only action you'll find is through the observations of young Tommy MacAllister. And wonderful observations they are! Somehow, like all good writers, McPherson gets into the head of Tommy, and through his perceptions we, the readers - presumably, older and more aware of life experiences than he - watch the progress of life as it unfolds around him. His older siblings, his parents, his neighbors, and his friends all get the introspective judgments we all make about those around us. Bringing back our own childhoods, we understand, sympathize and laugh as he faces what we knew to be true as we grew up. He does not enjoy greeting his great aunts, "...who looked formidable, like craggy fortresses within great unyielding fronts, as if they were all stony bosom from their shoulders to their thighs." and having to "...dutifully kiss their papery cheeks, avoiding if possible Cousin Maud's mole that sprouted long hairs." Dense in introspection, with long paragraphs that seep into your psyche, Testing the Current is clothed in the innocence of childhood. It is a truthfully told family story through the eyes of an eight-year-old who is unaware of the traumatic national recession during the 1930s, nor the rumblings of the coming war in Europe. Like any literary novel, it tests the reader's patience to delve deep, but well worth the effort! In Testing the Current William McPherson subtly sets off his wide-eyed protagonist’s perspective with mature reflection and wry humor and surrounds him with a cast of vibrant characters, creating a scrupulously observed portrait of a place and time that will shimmer in readers’ minds long after the final page is turned. William McPherson (b. 1933) is a Pulitzer Prize–winning literary critic, editor, journalist, and novelist. Born and reared in Michigan, he attended three universities over the course of seven years but left before attaining a degree. After a stint in the Merchant Marine (he is still an able-bodied seaman), he started at The Washington Post as a copyboy in 1958, soon becoming a staff writer and editor. He spent several years as a senior editor at William Morrow & Co. and returned to the Post, first as its daily book editor, then as founding editor of its independent book section, Book World. Later he moved to the newspaper’s editorial page, where he selected the letters to the editor and wrote a weekly op-ed column. After a two-year leave of absence, he left the newspaper in 1987 to write full time. His first novel, Testing the Current, was originally published in 1984. A second, To the Sargasso Sea, published in 1987, took up the story of the first novel some thirty years later. In 1989 he went to Berlin as the Wall was coming down and ended up in Romania in early 1990, shortly after the fall of the Communist regime, intending to stay for three days. Instead, he spent most of the next six years there, writing about post-Communist Romania for The Washington Post, Granta, and The Wilson Quarterly. D. T. Max is a staff writer at The New Yorker. He is the author of The Family That Couldn’t Sleep: A Medical Mystery, published in 2007, and Every Love Story Is a Ghost Story: A Life of David Foster Wallace, published in 2012.